The different colors reflected by a film of oil floating on a puddle of water depend on the thickness of the oil. The thinner the oil layer, the shorter the wavelength of light it reflects. An oil film reflects more colors at its edge because its thickness varies more there than in the middle. 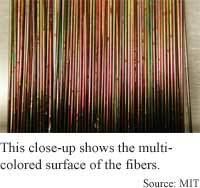 Researchers at the Massachusetts Institute of Technology have taken advantage of this principle to make long plastic fibers containing layers of metal that reflect light of specific wavelengths, giving the fibers mirrored surfaces. 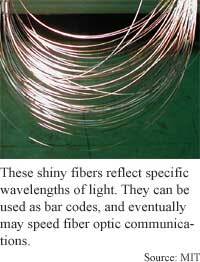 The fibers could be used as a type of bar-code or as optical filters. They also bring fiber-optic technology a step closer to being able to increase the number of wavelengths that can be transmitted at once through hollow fibers, which could speed communications. The researchers made the optical fibers using a common manufacturing process -- heating a thick tube of the layered materials, then drawing it into a long fiber with layers that are much thinner, but retain the same order and relative proportions. Although the process has been used to make fibers of different strengths and resistance to moisture, "very little work has been done controlling optical properties of fibers," said Yoel Fink, an assistant professor of materials science and engineering at MIT. The key to producing the mirrored strands was using two materials with opposite optical properties, but similar thermal properties. A reflective material requires layers that refract, or bend light differently, but keeping the fiber layers the same proportions as the starting tube requires that the layers soften the same amount under the influence of heat. "We found two materials that behave very differently optically, yet... behave identically under heating [so they can] be codrawn at the same temperature," said Fink. One of the materials has a high index of refraction, while the other has a low index of refraction, and the layers work together to block and thus reflect light of a certain wavelength or mix of wavelengths. "If you have the layered thicknesses commensurate with a wavelength or a certain fraction of a wavelength... certain wavelengths are not permitted to transmit and they can only be reflected," said Fink. At every layer of the materials, part of the light comes back and part is transmitted through; given enough layers few or none of the given wavelengths can get through, he said. The researchers drew the fiber from a one-inch tube containing 20 to 40 alternating layers of the materials. The individual layers were 20 to 30 microns thick, or about half the thickness of a hair. Drawing the fiber is essentially "shrinking this tube," said Fink. Drawing the fiber shrinks the layers to 100 nanometers thick, which is about one tenth the width of a bacterium, and 200 to 300 times thinner than the original layers. "In the process... we end up with hundreds of meters or even a few kilometers of fibers that have multilayers [that] basically are mirrors," said Fink. Depending on the thicknesses, the mirrors can reflect all or certain portions of certain wavelengths of light, said Fink. A single fiber could reflect, for instance, a precise ratio of three parts green light, which has wavelengths 550 nanometers long, one and one-half parts red light at 650 nanometers, and one part 450-nanometer blue light. A fiber with a very specific optical signature could be woven into a garment, and could act like a bar-code, said Fink. "You could basically encode information into any specific fiber and be able to read it off your clothes," he said. The fibers could also be used as optical filters that would be very low cost and also flexible, said Fink. Optical filters, which block specific wavelengths of light, are a common component of telecommunications equipment. "You're also able to build a tunability into these fibers," said Fink. Stretching the fiber can cause the layers to elongate, thinning the layers and making them reflect light of shorter wavelengths, he said. The researchers are now working on using the mirrors as part of a fiber laser to produce cloth that emits light, said Fink. "These would perform very well as laser mirrors, but you'd have to get a light source into there as well," he said. "Our next step will be to try to get light-emitting fibers." Longer-term, hollow fibers could be made with the mirrors on the inside, which could potentially guide many more channels of information than today's fiber-optic communications lines, Fink said. "We would use that mirror that's capable of reflecting light very efficiently at certain wavelengths... to line the inner core of a hollow fiber. You would be able to [transmit light] at wavelengths where silica is not very good, such as visible or infrared," he said. In addition, because transmitting light through air is more efficient than transmitting light through silica, this type of fiber could potentially transmit many more channels, or colors of information at once, increasing the bandwidth of a single fiber line. Because of the way light travels through silica, different wavelengths of light carrying different streams of information must be distinct so they will not interact. "You have to space the colors very far apart [in silica.] You could put many more colors into the same fiber," if the light is traveling through air, said Fink. Fink's research colleagues were Shandon D. Hart, Gary R. Maskaly, Burak Temelkuran, Peter H. Prideaux and John D. Joannopoulos. They published the research in the April 19, 2002 issue of the journal Science. The research was funded by The Defense Advanced Research Projects Agency (DARPA) and the National Science Foundation (NSF). Related Elements: Technical paper, "Multilayered Mirror Fibers," Science, April 19, 2002.